The writing style and worldbuilding. Both the world and the writing work together to give a very atmospheric, creepy feeling to the whole book. The magic system is kept vague, but I did not mind. I liked how it was portrayed and thought it was written very visually and beautifully. Also the fact that the big villain of the story was a wood was amazing and original! I felt like that really helped the kind of dark and creepy atmosphere. The characters. Agnieszka is a great protagonist. She’s just an ordinary plain girl with a tendency to look like a mess, but she didn’t feel like a typical ‘clumsy girl trope’ either. She’s stubborn and impulsive but still smart, loving and loyal and I loved that about her. Her interactions with the Dragon were amazing. I’m not gonna lie, they kind of have the ‘opposites attract’ trope going on, but I loved every minute of it. The Dragon is uptight and grumpy and constantly bickering with Agnieszka but it’s born out of this social awkwardness that I found endearing. Though this book has very little romance, there is a bit and what is there is perfection. The friendship. What the book focuses more on instead of the romance is one of the best female friendships I have ever read about. Agnieszka and Kasia’s friendship just warmed my heart and I loved that it is kind of what kept the whole story together. Even though there was horror and evil woods and magical corruption and so many things going on, this friendship always felt like a thread running through everything. Overall, I really loved Uprooted. If I could nitpick one little thing, then it is that I wanted just a bit more Agnieszka and Dragon scenes. What we got was amazing, but I just needed more. Also, though it is a fast paced book, I don’t think it’s a fast read. Not that that’s bad, but I felt like the writing style does require you to take your time to read. 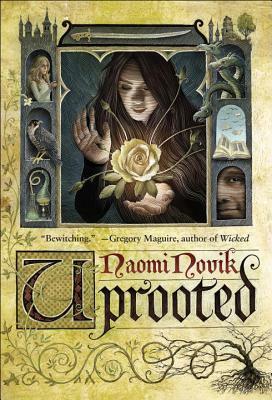 If you are someone who likes fast paced, creepy magical fantasies and stories that end up going farther than your expectations, give Uprooted a try! Awesome review Lindsey! Yay I am glad and happy you liked and enjoyed Uprooted, because I absolutely loved and enjoyed it as well and I really wanted more of Agnieszka and Dragon scenes too. Thank you for your awesome post.